You know Ron Gilbert, right? Maniac Mansion, Monkey Island? No? Maybe this story isn't for you then. Or maybe it is. A new game in the 80s point 'n click adventure style is coming to you via a Kickstarter project. If the target is reached. I know the retro style is getting "old". But if you can have a brand new game from the original programmer that made this style so popular, it's something different. New game means, a new story, new characters and new gags that those games was famous for. 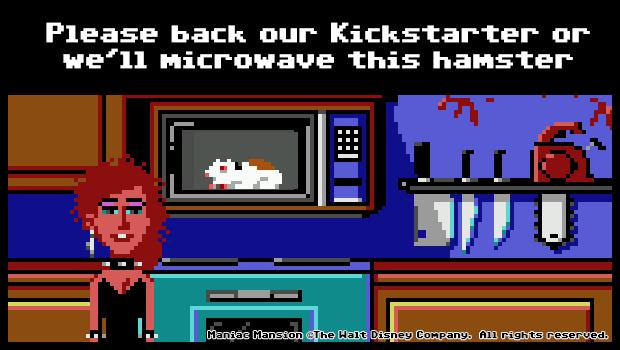 To make this happen, Ron Gilbert and Gary Winnick started a Kickstarter project. The goal is $375.000. While at the time I writing this, with 29 days left about $128.000 are already secured. So this should happen. If you are innocent like a new born child, you can chose other option, starting from $5. If you pay $20 or more you'll get the game, and with more money , you can get the soundtrack, a physical box, and other items. If you dare to give $5000, a supporting character in the game will named after you, and you can give it an appearance like you wish. Awesome. However, you really should back it up. The developers are quite clear on what happens if you don't.